Here we feature a newly published work on Chinese humour, and three speeches made at book launches organized to celebrate the volume in Sydney, Canberra and Melbourne from January to March 2012. 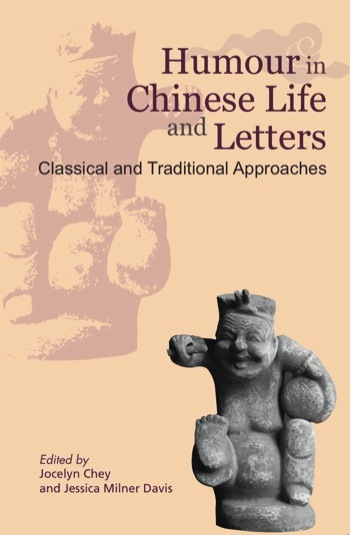 This book is the first of two multi-disciplinary studies of humour in Chinese life and letters. This first volume focusses upon traditional and classical approaches. Its sequel, dealing with modern and contemporary approaches, will appear in 2013, also with Hong Kong University Press. The books provide scholarly but accessible insight into how Chinese societies, past and present, approach the use of humour in literature and the arts, in personal life and in the public sphere. The serious study of humour is a recent phenomenon, so far more fully developed in Western scholarship than in Asia. Accordingly, our book sets out to give an account of Chinese humour and also to explore connections and contrasts with Western concepts and humour-styles. It examines the etymological difficulties of dealing with the word humour or youmo 幽默 in Chinese language and understanding. Its sequel will give an account of contemporary varieties of humour but also engage directly with the challenge of applying empirical research methodology to humour studies in Chinese societies. We believe this is the first work in either English or Chinese to address the full complex range of Chinese traditions of laughter and humour and their extraordinarily varied and unique comic forms. Of course it is far from complete and more remains to be explored and appreciated. However, reviewers have already remarked on the book's contribution to the growing international scientific literature that addresses humour and laughter as universal forms of human behaviour. We believe that both volumes will have an important impact on the work of psychologists and other social scientists as they increasingly extend studies based on European conventions about humour into Asian societies (including China, Hong Kong, Taiwan and the Sinosphere more broadly). This first volume provides a reliable cultural and historical account of Chinese tradition and convention as essential background to such empirical approaches and its sequel explores some of their immediate consequences for research methodology. As co-editors, we have worked with contributors including internationally respected scholars in Chinese Studies and specialists in other fields such as humour studies, history and philosophy of science, film, communications, marketing and psychology, who are based in mainland China, Hong Kong, Australia, Canada, Taiwan, Switzerland, the USA and the UK. The unifying focus of both books is humour in its multitude of expressive and behavioural forms. While their enquiry methods vary, all chapters are written (and fully annotated) in a style that is accessible to the generalist reader interested in the topic of humour, as well as to the China scholar. Full academic resources are provided, including Chinese characters for all key terms, charts, tables, illustrations and a unique two-part international bibliography on humour in China. Preparing this volume has been a labour of love for us both and an attempt to combine our specialized knowledge in two seemingly different fields—comedy and humour for Jessica Milner Davis and Chinese culture and history for Jocelyn Chey. Decades ago, as sisters in Sydney, we pursued doctoral studies in these quite separate fields. Then we went our separate ways—Jocelyn to Canberra, Beijing and Hong Kong, and Jessica to Bristol, Paris and America. In the first decade of a new century and having returned once more to Sydney, we came together at a conference of the Oriental Society of Australia and realized that before us was a project we seemed fated to undertake in partnership. We hope this work will contribute to cross-cultural understanding. Humour is often dangerous, since—like many other forms of human behaviours, both innate and learned—it may be used for both good and ill. While it is an important survival technique for those under personal stress or in subordinate positions, and an excellent adjunct to teaching and learning when well used, humour can also wound and exclude. Further, it represents a challenge to authority of all kinds. Different cultures and times have evolved a range of protocols and social conventions for channelling and containing humour-making and humour-appreciation. Every country—especially Australia—has its own approach to what it is possible for one to get away with in humour, when and with whom. In Australia, you can pretty much 'take the mickey' out of anyone, almost at any time. When abroad, Australians quickly learn that this does not always work elsewhere and that humorous behaviour needs to be modified. Equally, people from more reserved cultures soon discover what to expect from Aussies in their own environment. A deeper awareness of such cultural differences can only enhance international understanding. De gustibus non est disputandum: even when better understanding exists, personal differences in tastes and attitudes regarding humour will remain. But what this volume shows is that East and West have more in common when it comes to humour and laughter than is commonly thought. Beneath superficial differences in topics and styles of joking and comedy, or in public laughter and the shape of linguistic puns, this book reaffirms the commonality of human attitudes to enjoying (and censoring) humour. Such insights are, to us, a source of satisfaction. And we would urge those who may be inspired to order the book or take an interest in humour studies always to remember xue wu zhi jing 學無止境 (there are no boundaries in study)—especially about humour. It remains only to thank our distinguished launchers for their kind support and words of praise for the significance of our joint venture. And of course to hope that the results prove enjoyable for all its readers. Jocelyn Chey is Visiting Professor in the School of Languages and Cultures, University of Sydney. She has held senior positions in both the Australian diplomatic service and academic life. In 1973, she was Lecturer in Chinese Studies at the University of Sydney, then moved to Canberra when Australia first established diplomatic relations with China to bring her skills to bear in the civil service. For more than twenty years, she contributed to the development of Australia-China relations in both the Department of Trade and that of Foreign Affairs. She was posted three times in China and Hong Kong in positions which culminated in her appointment as Consul-General in Hong Kong during the years 1992-1995. Dr Chey was the key administrative officer in the Australia-China Council when it was founded in 1979 and built its activities and reputation. From 1988-92, she was Director of the China Branch of the International Wool Secretariat, based in Hong Kong. Retiring from public service, she accepted appointment as a Visiting Professor at the University of Sydney and is a consultant on Australia-China relations. She is a frequent speaker and lecturer on Chinese affairs and has led study tours to China for the University of Sydney's Centre for Continuing Education. She is a fluent speaker of both Mandarin Chinese/Putonghua and Cantonese Chinese. Jessica Milner Davis is an Honorary Associate in the Faculty of Arts and Social Sciences at the University of Sydney. She has been studying humour since publishing her first book (on farce) in 1978 as an independent scholar. She undertook her doctoral studies at the Universities of NSW and Bristol and during the 1970s pursued research at Stanford University and in Paris on the history of comedy, before returning to UNSW where she served as Deputy Chancellor from 1981-1990 and Pro-Chancellor 1996-2006. She has been a Visiting Scholar at All Souls College Oxford, Clare Hall Cambridge and at the Università di Bologna. She served twice as President (1996 and 2001) of the International Society for Humor Studies and convenes the Australasian Humour Studies Network (http://www.sydney.edu.au/humourstudies), whose 18th Annual Colloquium took place at The Australian National University in February 2012. Dr Davis' current research concerns comic genre, the history and theory of comedy, and cross-cultural studies of humour. She is an Editorial Board member for Humor: International Journal of Humor Research (Mouton de Gruyter, Berlin) and the John Benjamins book series on Humour Research; and Commissioning Editor for entries on History, Literature and Drama in the forthcoming Sage Encyclopedia of Humor Studies, edited by Salvatore Attardo.